Sadly many pubs are closing in London and England because of taxes and the fact that most people now prefer to buy cheaper alcoholic drinks in supermarkets and cut-price shops to drink at home. These closed pubs end up being demolished or converted by property developers into apartments and flats. Such is the building boom in London that houses & former commercial property are now being turned into apartments to make a quick profit on sale or rental. We have lost three local pubs each over 100 years old to such in the last few years. These closed pubs end up being demolished or converted by property developers into apartments and flats. Such is the building boom in London that houses & former commercial property are now being turned into apartments to make a quick profit on sale or rental. We have lost three local pubs, each over 100 years old, to such in the last few years. Numerous history and convivial social meeting places are now disappearing from the London landscape and culture. The Blind Beggar was built in 1894 on the site of an Inn dating from 1654.
Notable events in its history include where William Booth preached his first open air sermon then forming a Mission that led to the founding of The Salvation Army. The first modern Brown Ale ( my first beer when a teenager) was brewed and sold in the pub which was then part of Manns brewery. The pub’s name is linked to a popular legend concerning a local connection with a knight, who was the son of the famous Simon de Montfort , an Earl, who rebelled against King Henry III in the 13th century. Noblemen, merchants, and knights courted her but when they found out that there was no dowry they all left, except for a lone Knight, who was not concerned about a dowry and loved Besse as she was; as herself. Now, what captured my imagination to the Blind Beggar many years ago, is my interest in major historical crime cases of London. In March 1966, a murder took place in the Blind Beggar, which later became part of London crime legend. Ronnie Kray, the twin brother of Reggie, the notorious, infamous and any other ..’ous’! Kray Twins walked into the pub and calmly took out a pistol and shot and killed another criminal, George Cornell, in front of a few witnesses. Ronnie Kray had a long-standing score to settle with Cornell, who was apparently as ruthless as the Krays, but who was nowhere in their league. Such was Krays power & influence in the 1960s London’s criminal underworld, many involved kept quiet about the Twins activities for years before they were arrested and sentenced to 25-30 years in prison. There have been many books about the Krays & by the Krays too, which are interesting to read, if one is interested in major crimes. Two movies have been made about the Krays too. They are truly legends in the criminal history of London. It appears from current on-line reviews that the Blind Beggar today is a shadow of its former standing as a popular east end pub. I hope the pub remains as a pub for many years to come as London cannot keep affording to lose such culturally important pubs. As astronomy is a hobby & keen interest of mine, I eagerly awaited the lunar eclipse. This lunar eclipse had more publicity due to the fact that it coincided with the appearance of the so-called Supermoon. Astronomers don’t really prefer to call it a supermoon. The term would be perigee new moon or perigee full moon. When the moon change in its orbit and is closest to earth, this is called a perigee (within 98 per cent closest to the earth). When it is a full moon and it is 98 per cent of its closest orbit (perigee) to the earth this is commonly called a supermoon. There can be 4-6 supermoons in a year. There won’t be a perigee full moon in 2017 because the full moon and perigee won’t realign again (after November 14, 2016) until January 2, 2018. The next supermoon lunar eclipse will be in 2033. As I have just retired from my work career, I could fortunately stay up Sunday evening to the early hours of Monday morning. 🙂 I had my trusty camera ready and waited in the garden. weather conditions were ideal, as not too cold after midnight with some wisps of white cloud that conveniently disappeared; so a clear dark sky for the show to begin! Around 2am, the top left of the moon was starting to be covered by earth’s shadow as it crept across the moon’s surface. Totality and complete earth cover happened at around 3 am. A lunar eclipse totality lasts much longer than the spectacular solar eclipse that is over in a few minutes. I watched the eclipse for 3 hours. The moon’s surface facing the earth becomes an amazing coppery colour. Some cultures call it a ‘Blood Moon’ because of the reddish hue and regard it as a bad omen. Of course the colour is caused by the sunlight being scattered through the earth’s thick atmosphere so the moon is never blacked out like the sun becomes briefly in a solar eclipse at totality. The moon does not have an atmosphere anywhere as thick as the earths to scatter any light. At sea level on Earth, we breathe in an atmosphere where each cubic centimetre contains 10,000,000,000,000,000,000 molecules; by comparison the lunar atmosphere has less than 1,000,000 molecules in the same volume. It’s faint trace of atmosphere contains molecules including helium, argon, and possibly neon, ammonia, methane and carbon dioxide. There is no oxygen as abundant on earth. I managed to get some reasonable photographs as the eclipse was finishing around 5am. During my eclipse vigil in our back garden into the small wee hours as we say, a curious urban fox came close to me to see what I was up to then wandered off! This our grace-year, as I live! Time is passing fast and furious. Where has the time gone?!!! 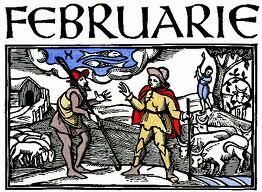 Well anyway February is known for being the lurve month, because of St Valentine’s Day which of course falls due on the 14th of this month. The gemstone connected with February is the Amethyst which is a symbol of wit and health. 1 February 1884, the very first edition of the Oxford English dictionary was published. 9 February 1962, Jamaica became independent! 10 February 1884, Queen Victoria and Prince Albert tied the knot. 11 February 1929, Vatican City was created as a standalone independent state. 13 February 1888, the first issue of the Financial Times came out. 14 February 1929, this day became known as the infamous St Valentine’s Day Massacre, which happened in Chicago. 16 February 1937, we’ve got nylon! It was this day that it was patented. 18 February 1979, it snowed at the Sahara Desert. 22 February 1997, ‘Dolly’ the sheep was cloned.